Place the chocolate, milk and butter into a medium microwaveable bowl. Microwave on MEDIUM for 30 seconds. Stir. Repeat until the mixture is melted and smooth. Unfold the pastry sheet on a lightly floured surface. Roll the pastry sheet into a 16x12-inch rectangle. Spread the chocolate mixture on the pastry to within 1 1/2 inches of the edge. Sprinkle with the walnuts. Starting at a short side, roll up like a jelly roll. Place seam-side down onto a baking sheet. Tuck the ends under to seal. Brush with the egg mixture. Bake for 35 minutes or until the pastry is golden brown. Let the strudel cool on the baking sheet on a wire rack for 30 minutes. Sprinkle with the confectioners' sugar. 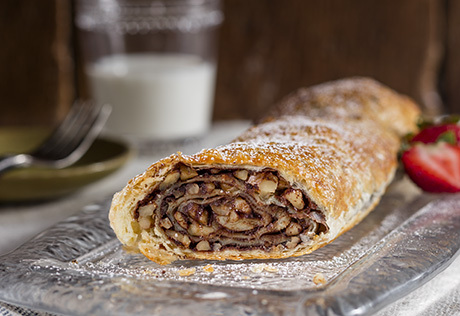 To decorate the strudel, thaw and roll out another pastry sheet into a 12-inch square. Cut the pastry into shapes using a cookie cutter. Press the cut-outs onto the top of the unbaked strudel and brush with the egg mixture. Bake as directed above.